Who needs a yacht? 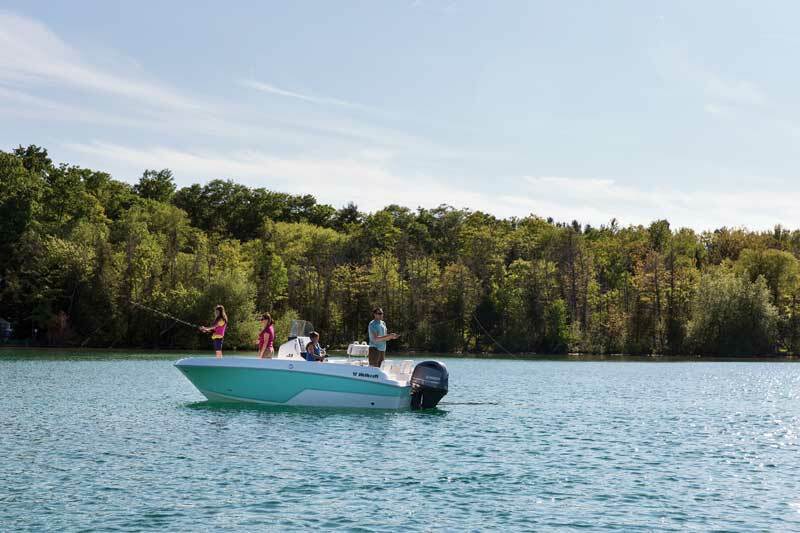 Boats like the Wellcraft 182 Fisherman prove that size doesn’t matter when it comes to family fun and fishing. What’s the perfect size boat? Naturally, there’s no one answer to that question. But for a huge number of people, an 18-footer is going to prove ideal. It’s small enough to stow in the garage or driveway, tow easily, and run economically. Yet it’s large enough to take out the family on the Chesapeake and its tributaries. If these are the traits you’re looking for in a boat, the Wellcraft 182 Fisherman is a must-see option. Yes, this is a center console fishing boat. But don’t let that deceive you, it’s also a family fun machine with perks like twin aft folding jump seats, a head compartment inside the console, and (optional) bow seating and cushions that turn the bow into a sunpad. And note that the head compartment is actually useable by a full-grown adult, which is not the case with many boats of this size. Wellcraft makes it possible by employing a forward console door which essentially consists of the entire front of the console. It swings up on gas-assist struts, providing an entry twice the size of what you’d expect from an 18-footer. 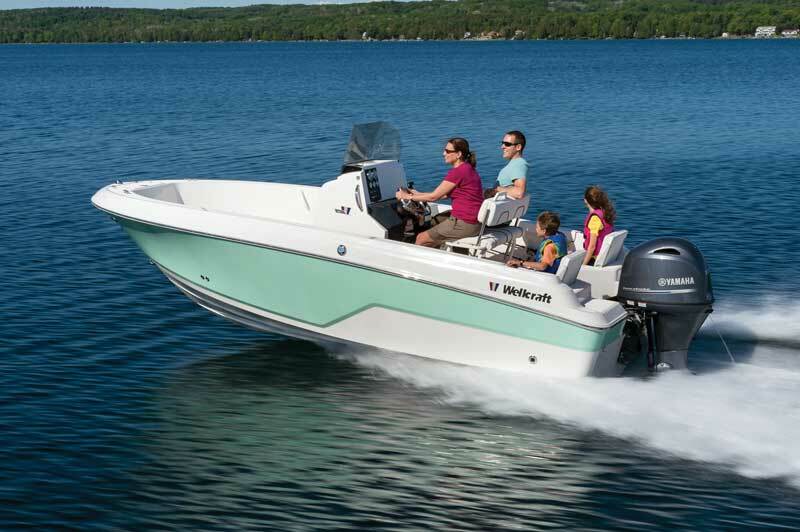 Maybe even more important for family fun is that the Wellcraft 182 can be had with a ski tow pylon—if you have kids, you’ll want this option for sure. Anglers will be more interested in features such as the under-gunwale rodracks, flush-mount rodholders, and a helm with a large flat for flush-mounting a GPS/fishfinder. The hull draft is a mere 15 inches, so you can prowl the shallows to cast for stripers at daybreak and sunset. Wait a sec—what about a livewell? Not only does the 182 Fisherman have one, it has a unique livewell that even adds to the boat’s enjoyment factor. It’s built into the foredeck, and the entire back bulkhead is a single piece of see-through Plexi. Fill it up, add in a few scoops of minnow or shrimp, and the kids will be entertained by the aquarium-like view. Added bonus: you can always keep an eye on your livies, and make sure they’re healthy and happy. 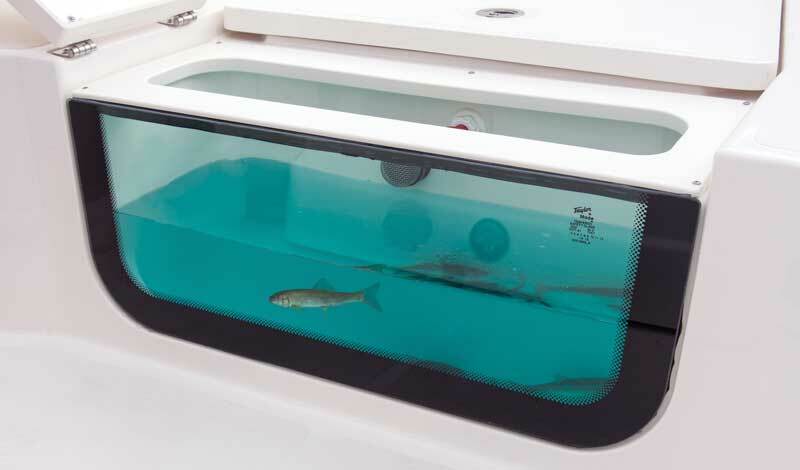 The livewell is built into the foredeck so you can always keep an eye on your bait. The 182 can take up to 150 horses on the transom, but as we mentioned earlier, one of the nice things about an 18-foot boat is that you can run it quite economically. Opt for a Yamaha F115, and you’ll find that you have plenty of power; the top-end hits 37.8 mph and cruise speed at 4500 rpm is 25.8 mph. Economy is quite stellar at this pace, with a fuel burn of just 4.9 gph. That means you’ll be getting almost 5.3 mpg and would have to cruise for 10 hours straight to come close to emptying the 56-gallon fuel tank. You say performance trumps economy? Fine, go with a 150-horse outboard. Just be sure to tell the kids to hang on tight, because you’ll soon be hopping up on a plane in a neck-snapping six seconds, and zipping across the Bay at a top speed up to 45 mph. Construction-wise, the 182 Fisherman delivers exactly what you’d expect from Wellcraft. The switches at the helm are lighted toggles, wiring is tinned-copper, and stringers are foam-cored. Glancing at the underside of the anchor locker hatch gives you a lot of insight into just how the 182 is put together. Many builders cut corners and mold cheap hatches that are unfinished on the underside, especially when it comes to smaller, less expensive models. Not so with the 182, which Wellcraft builds the same as its larger boats. You’ll discover that the hatch is fully finished on both sides, and even has the trademark Wellcraft “W” molded in underneath. What’s not to like about the Wellcraft 182? There really isn’t much to beef about. The best we can come up with is noting that the this is a deep boat with tall gunwales, which can lead to a higher center of gravity and faster drifts when drift-fishing. But that’s also a trait many parents like, since tall gunwales tend to keep kids inside the boat where they belong and eliminate worries about falling overboard. We can’t even hassle Wellcraft over the pricing, which isn’t any higher than a nice Hyundai. And we can absolutely, positively guarantee you one thing: owning a Wellcraft 182 Fisherman will be one heck of a lot more fun than any car on the lot.